Thomas W. Horton, former chairman and CEO of American Airlines and former chief financial officer of AT&T, will be the Forum on Entrepreneurship Breakfast Series keynote speaker Thursday, Oct. 4. Horton is now a senior adviser at the private equity investing firm Warburg Pincus. The event, hosted by the Meadows Center for Entrepreneurial Studies at St. Mary’s University, will be held at the Pearl Stable of the Historic Pearl Brewery. Registration, networking and breakfast begin at 7 a.m., followed by the program at 8 a.m. 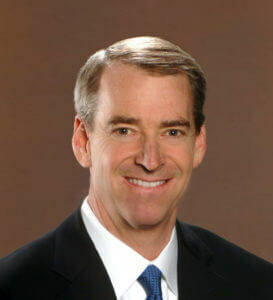 In 2002, Horton joined AT&T where he served as vice chairman and CFO. In 2005, he led the evaluation of strategic alternatives, which led to merging with SBC — forming the new AT&T. After returning to American Airlines in 2006, Horton led American through a successful restructuring and turnaround, which culminated in the merger with US Airways, creating the world’s largest airline. Following the merger with the US Airways Group, he served as chairman of the American Airlines Group until 2014. Horton was also chairman of the oneworld® global airline alliance. He joined Warburg Pincus as a senior adviser in 2015. Horton holds an MBA from Southern Methodist University. Steve Ison, CEO and co-founder of Rebecca Creek Distillery LLC, will be the featured speaker at the next Forum Breakfast event on Thursday, Nov. 8. The series’ 2018-2019 title sponsor is PwC. For information on sponsorship opportunities and purchasing tables and individual tickets, please contact Pamela Duffy at forumbreakfast@stmarytx.edu or 210-436-3124.